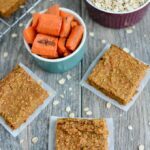 These Carrot Oat Bars make the perfect healthy snack. They’re dense, chewy and easy to make in the blender. Plus they’re kid-friendly and also make a great addition to breakfasts and lunches. Add ingredients to blender or food processor in order listed (except raisins and/or coconut if using). Stir in optional mix-ins if desired. Spread into a 9×9 pan lined with parchment paper. You can sub steamed carrots but add 1-2 Tbsp more maple syrup. I don’t use mix-ins. I just imagine they’d taste good because they pair well with carrot cake. If you want to add frosting, you can use whatever kind you want. I just mixed together cream cheese (softened) and powdered sugar until it reached the right sweetness and spread it on top of a couple. You can also make these as muffins.